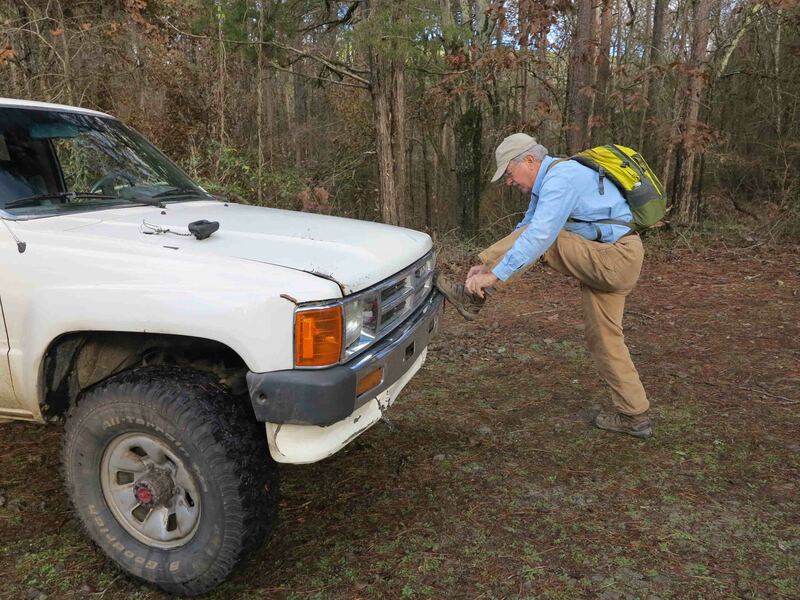 Part of the fun of hiking is driving to the trailhead. 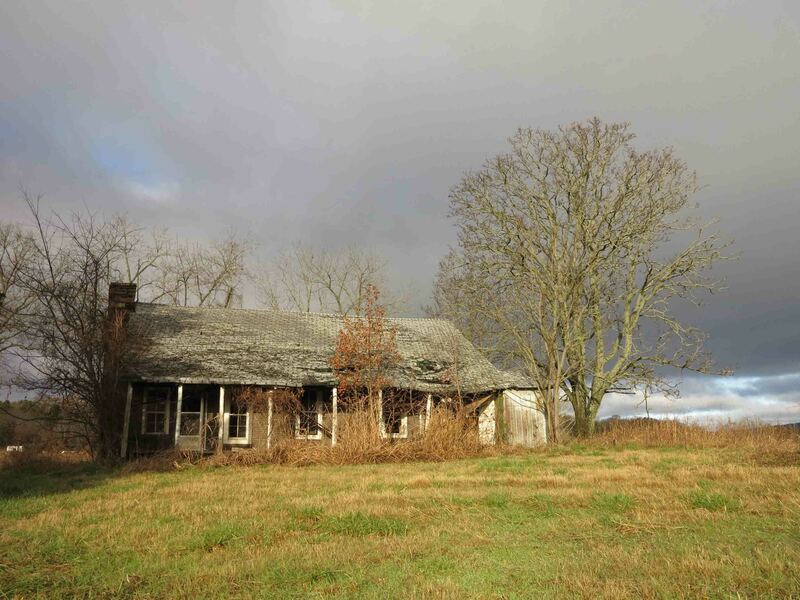 I just had to stop when this abandoned house caught my eye. I was looking forward to hiking with Mike LeMaster. He is a “heavy hitter” when it comes to trail maintenance, but today he hiked without his chainsaw. We had a good visit while on the trail. He is shown here with his famous Toyota go-anywhere truck. This little truck has slid into a couple of ditches and a barbed wire fence, but just keeps going and going. We decided to avoid running a shuttle and did the Redding Loop. We passed this “would be” waterfall. I thought about a kayaker who often said, “If there were water, we could float this.” I thought to myself, “If there were water, this would be a waterfall,” but it was just a trickle today. The little valley was a pleasure to see as the trail followed around its edge. We didn’t make the spur to Spy Rock but enjoyed seeing it from a distance. Below is a picture taken from the bluff a couple of months ago. Sean is cutting up (carefully) on the edge of Spy Rock. After completing Redding Loop, Mike headed back to Fayetteville to catch a football game. Hiker-dog and I had one more hike in mind. 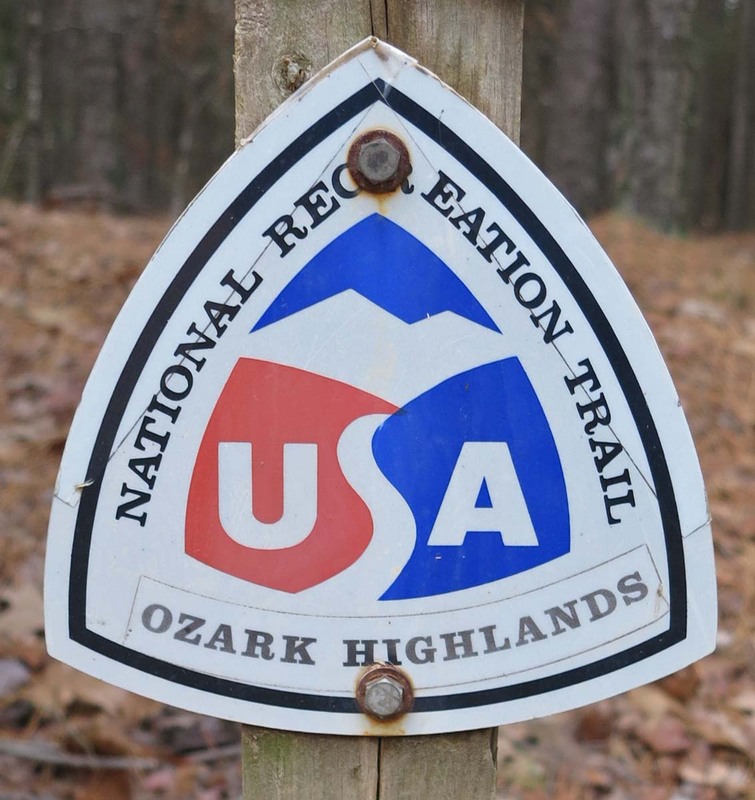 We drove up to Morgan Fields Trailhead with the idea of doing an out-and-back to Hare Mountain, the highest point on the OHT. 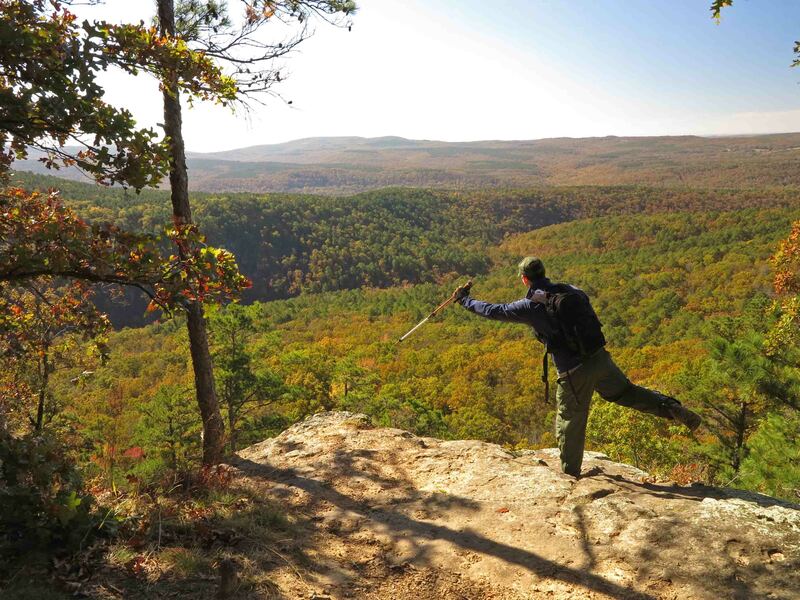 This out-and-back hike was on the Ozark Highlands Trail, passing mile marker 43, and 44. I’m always pleased to see these little trail signs at road crossings. I must associate them with good experiences on the trail. 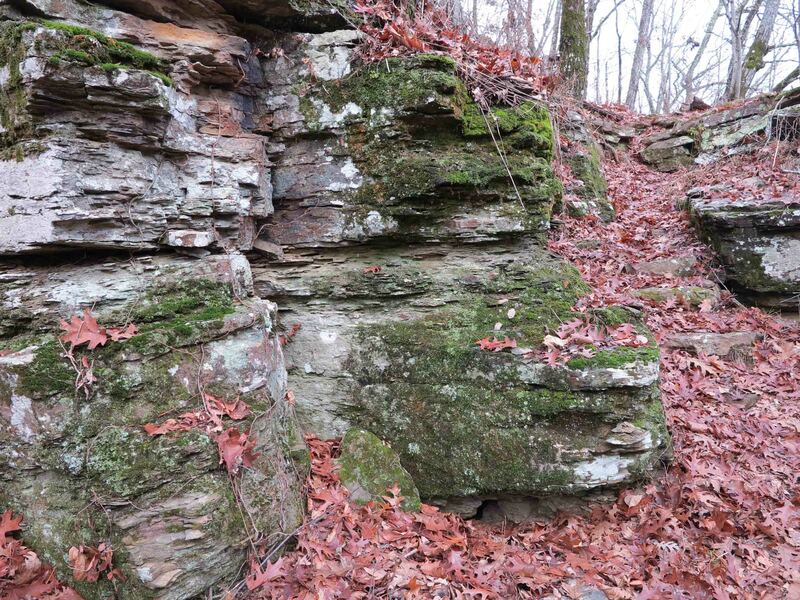 The trail passes a rock wall. I wish these walls could tell stories of the people who built them. 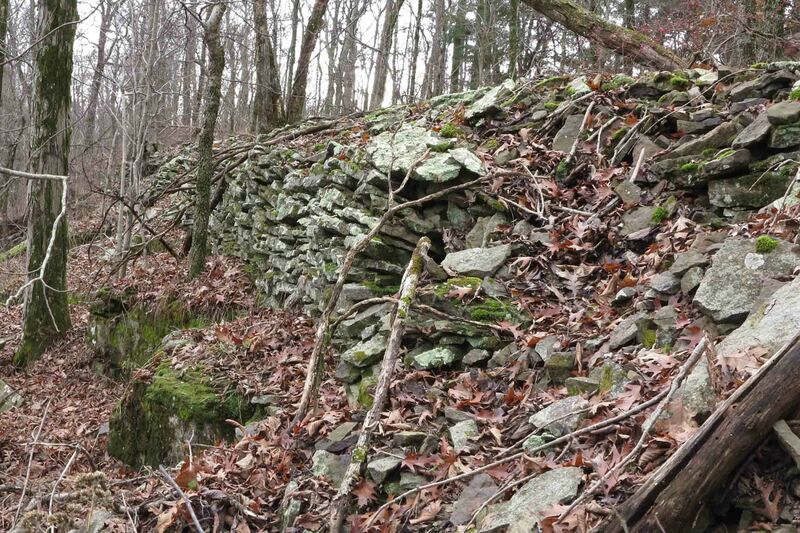 Below is a picture of a small portion of rockwork that forms the base of a section of historic roadbed. The trail follows this road for a short distance. 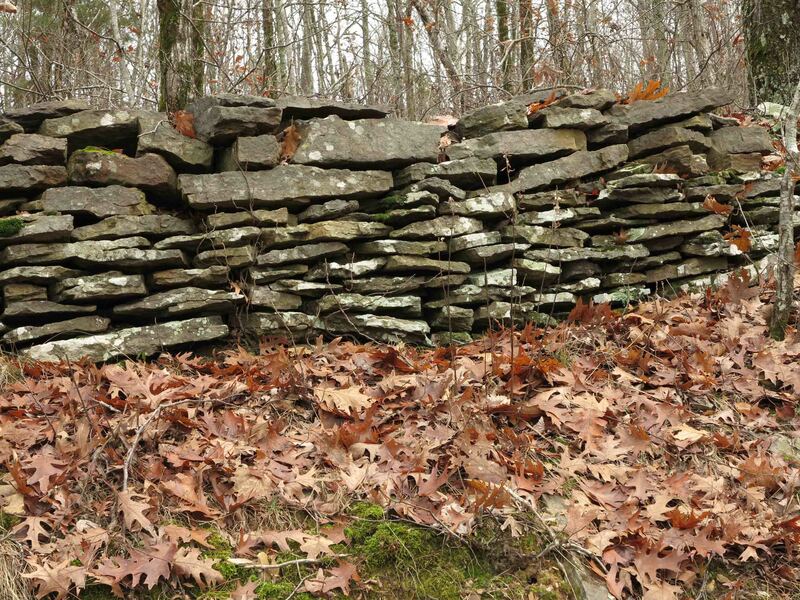 Over the years, some of the stone retaining wall has been torn up by falling trees but much of it has stood the test of time. I can’t imagine how much physical labor went into building this little section of road. The trail climbs steadily and cuts through a couple of rocky crags. 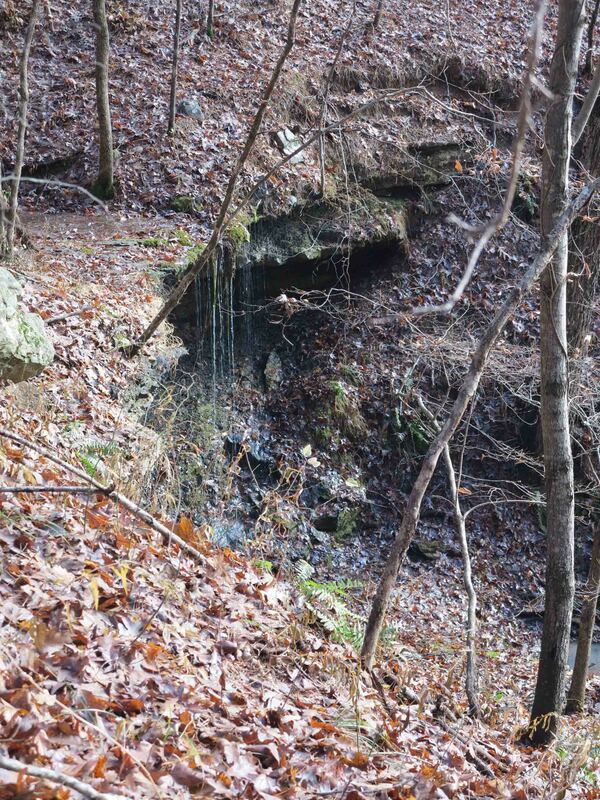 It’s December 6, and I’m hiking in a t-shirt. I was chilly but avoided breaking a sweat on the climb. 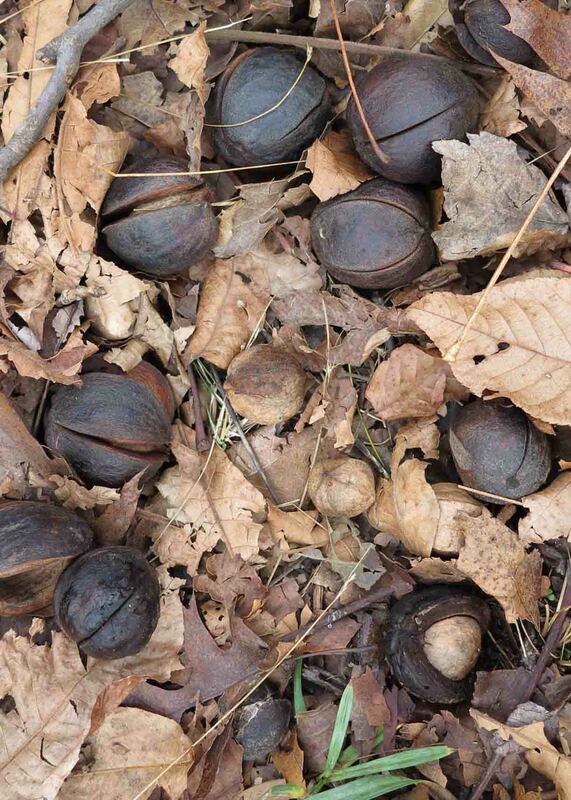 Hickory nuts were plentiful on top of Hare Mountain. I picked one up and tossed it for Hiker to chase. To my surprise, she began to crack it with her teeth. Half fell out on the ground, and she chewed up the other half. I dug out some of the nut and tried it. Pretty good but a lot of work. The hickory nut Hiker cracked for me. 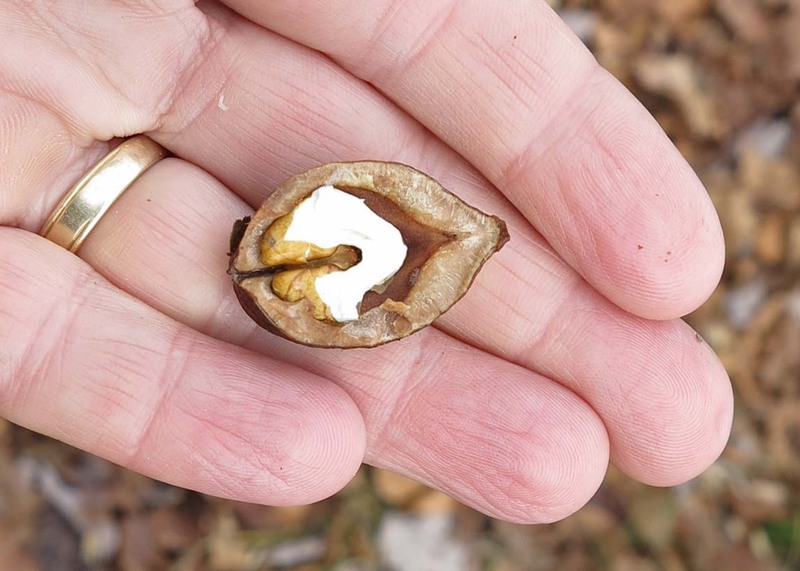 Hiker chewing a hickory nut. 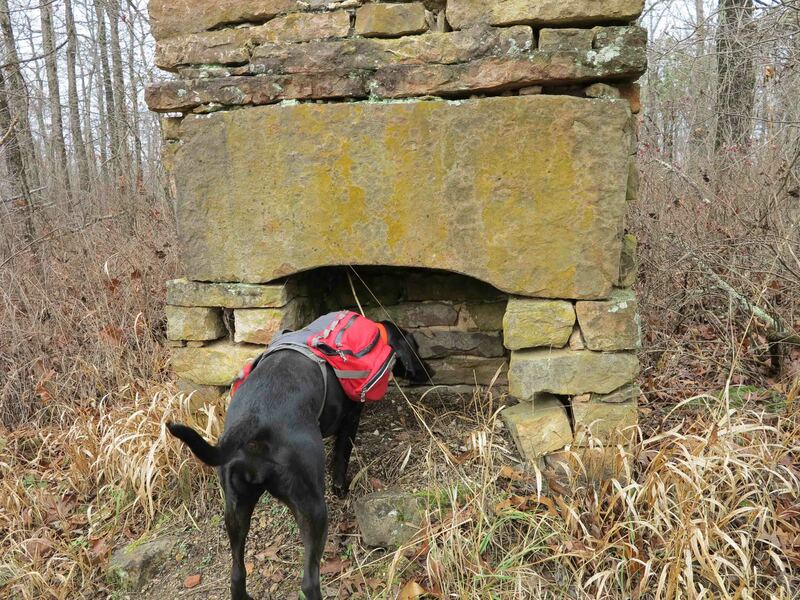 Hiker inspected the homestead chimney and well. I’m always impressed with the mantel stone on this fireplace. It appears that some mortar may have been used, but there are no firebricks. I would like to know the date of construction. 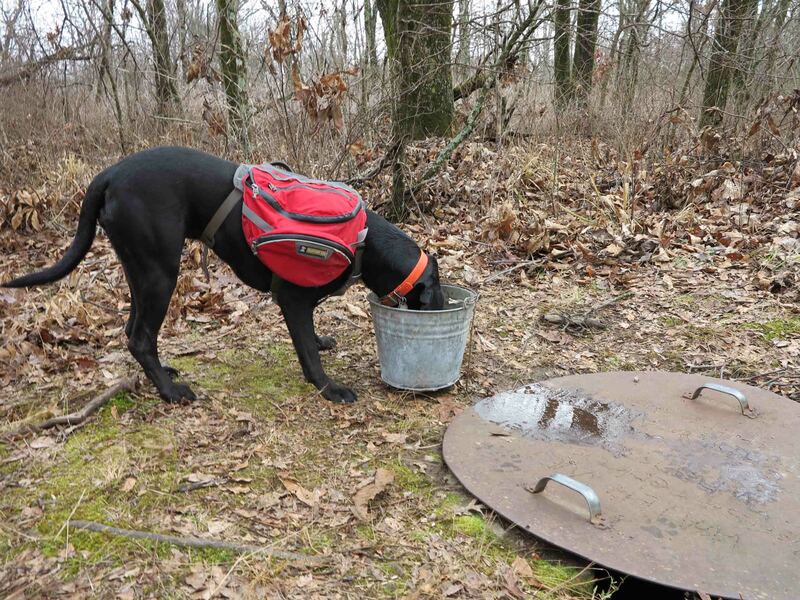 I peeked under the well lid to check the water level. It was about two feet from the top and pretty cloudy as usual. Rain water had collected in the bucket. 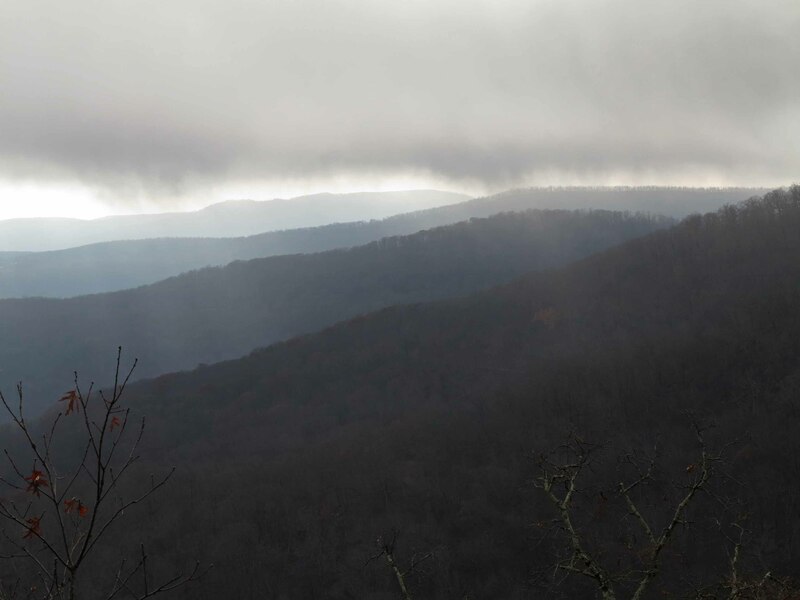 Even on foggy days, the view from Hare Mountain is a joy to see. A quick hike down the mountain and we called it a day, another very good day on the trail! 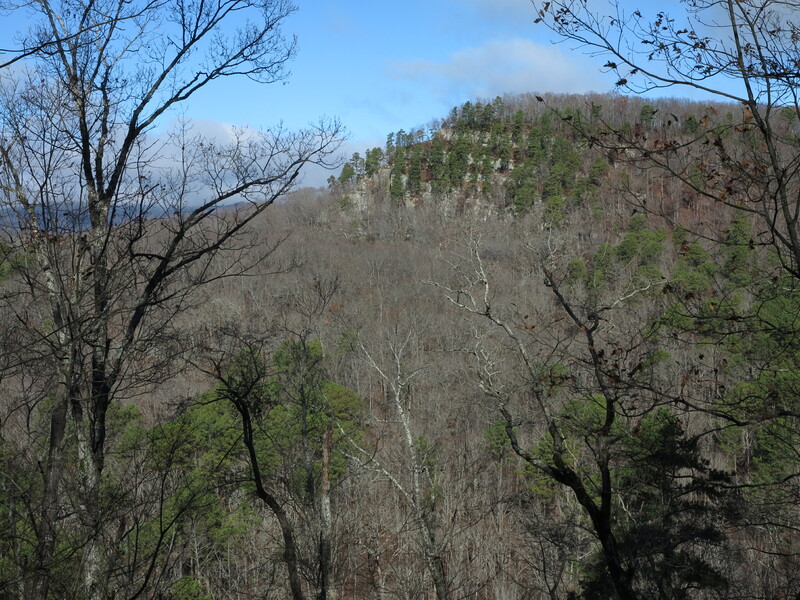 If you’d like to see more of the Ozark Highlands Trail, here’s a slideshow from my thru-hike last winter. 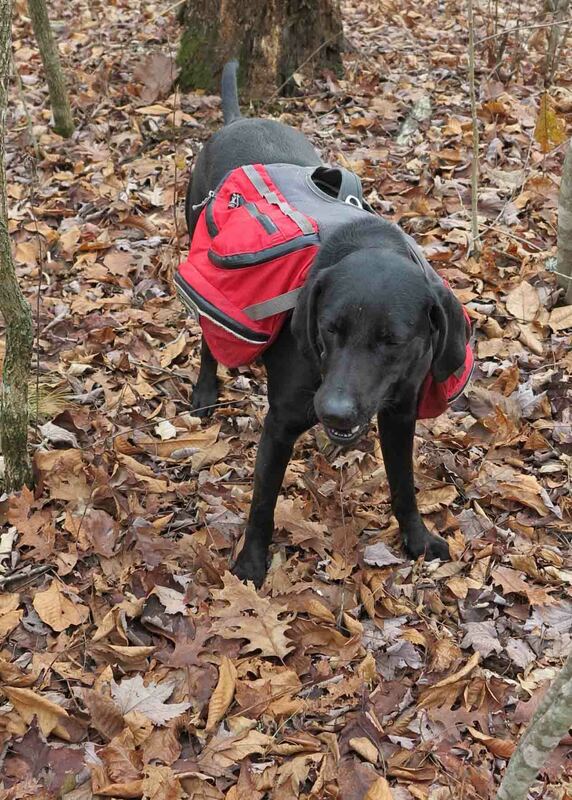 This entry was tagged Hare mountain, hickory nuts, Hiker-dog, Mike LeMaster, Ozark Highlands Trail, Spy Rock. Bookmark the permalink. Thanks so much for your photos and words; it gave me a chance to revisit happy times on the OHT. 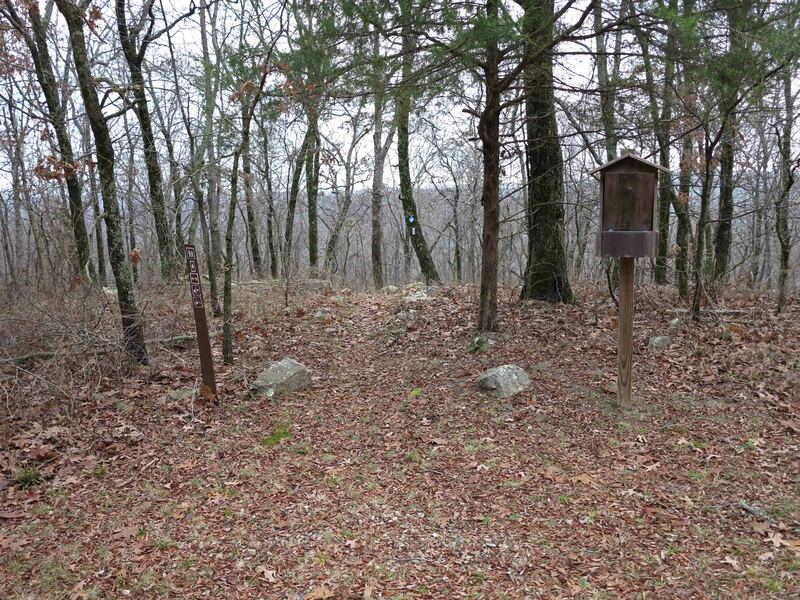 At one time I lived just off the pig trail and close to Cherry Bend trailhead. Morgan fields such a nice hike. Mary, you’re well known in hiking circles. It pleases me to know you’re reading and following along.